Chemical preparation in wastewater and water treatment directly impacts many downstream processes. Let’s take a look at several common chemicals used and some key factors that influence their preparation and the selection of wastewater mixers. When preparing lime slurries for controlling pH, uniformity is critical. Why? Because lime solids must reach/stay in suspension if they are to serve their purpose in downstream processes. For this reason, it’s essential that wastewater and water treatment facilities have lime slurry mixers that can efficiently and effectively make up/maintain uniform slurries. 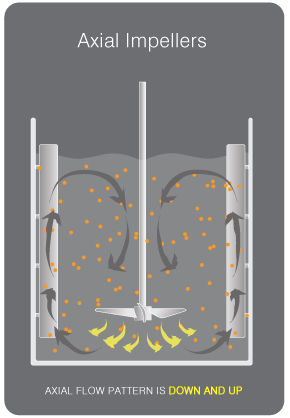 Lime slurry mixers should have impellers with airfoil blades because they promote a long, laminar flow that maximizes the area of influence. The diameter of the impeller should also be customized to the tank: 0.3 to 0.5 impeller to tank diameter ratio would be optimal. While we have a full range of impeller types at Dynamix, we typically recommend our Dynaflow™ airfoil blade for lime slurry mixing. In any mixing solution, the mixer shaft should be engineered to prevent the destructive forces caused when critical speeds are reached. At Dynamix we design the shafts to operate 65% below the first critical speed: this is well below industry best practice, which is to stay at least 20% below the first critical speed. This minimizes shaft vibration and deflection. Optimized mixing doesn’t stop at the mixer. That’s why we recommend configuring the non-mixer components of your process, including baffle sizing and ideal tank selection. Dry carbon particles tend to float: if they’re to be incorporated into the mixture, proper wetting during makeup is critical. As with lime slurry mixing, a mixer that generates an axial flow pattern will be most effective for mixing dry carbon. Carbon slurry particles tend to float, so they need to be “sucked” into the liquid from the surface. The axial flow impeller placed close to the liquid interface will provide the best mixing for wetting out the particles. Once the carbon particles have been wetted out, they need to be brought into suspension. We recommend using a radial flow impeller. The impeller should also be positioned close to the tank bottom. 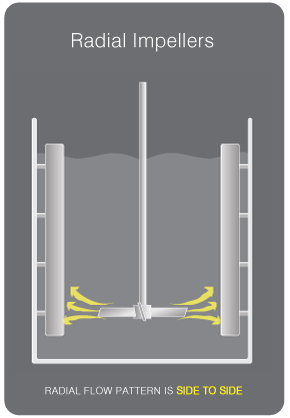 To keep activated carbon particles suspended, the process used when bringing them to suspension should be repeated continuously during storage until they are ready for use. Polymers are used in wastewater and water treatment to enhance flocculation by optimizing the strength, size and weight of flocs. Before they can be added to the flocculation process, the powder or neat forms of polymers need to be activated and aged. Facilities that receive their polymers in totes have to prevent stratification. The solution for this job is a portable mixer that can be easily inserted into plastic totes. For our clients, we recommend the ITM. The collapsible impellers allow insertion of blades much larger than the small tote opening in order to generate the desired axial flow pattern. The waste water mixer you need depends on your process and the chemicals you use in that process. If you’re interested in learning more about mixing solutions for your process, post a comment or email us at [email protected]. As part of my design project, i am designing a flash mixer for a domestic waste water treatment plant and wanted some help on how to design it. I am adding about 6.6 mg/l of alum into the mixer to create flocs. What more information would you require to help me out? Hello Prit, thank you for your comment. To expand on this post further there are several other factors that you will need to look into; namely, tank dimension, residence time, and mixer calculation. Lastly, we’ll need to know more about mixer calculations and how to perform them. To preliminary size the mixer the wastewater residence time in the tank is needed. For this example let’s assume a 30 second residence time and a volume of 100 gallons. Therefore we’d select a mixer with at least a 1/3 HP motor with impellers that are approximately 1/3rd of the tank diameter that produces violent agitation or a flow rate of at least 1.5 times greater than the maximum flow rate through the tank. If you need more assistance in sizing up the mixer, feel free to send us your precise parameters in order for us to size the mixer for you. We would recommended a 562mm Dynaflow Impeller, based on the equivalent tank diameter. However, this is only the recommended size of the impeller as the other variables such as tip speeds of the impeller and the G-Value need to be considered. Based on a typical G-value of around 100 1/s it would be recommended that the mixer be a 1/2HP motor @ 83rpm with a 559mm Dynaflow impeller.